Wafts of roasted malt, caramel and digestive biscuits ! on the pour from this. 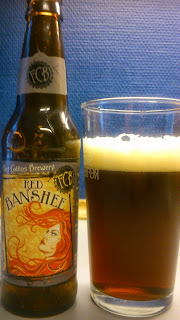 Red Banshee pours a clear deep amber to ruby red with a creamy off-white head. Burnt malt, nuts, caramel and prunes in the intake while the finish is hoppy and light bitter. Prunes, malt and brown sugar are left lingering in the not very pleasant aftertaste. Low carbonation with quite a thin mouthfeel but not watery. I'm left unsure if I like this one as I hate prunes with a vengeance, evil horrible tasting little things..if it is actually prunes but that is what I am getting. You of course could taste something completely different ! Aside from that I did not get a whole lot of enjoyment out of this one as I thought it was pretty mediocre. Not one I will be buying or drinking again. Summing up, no highlights and a shrug of the shoulders after finishing it means for me it is average. This scored a generous 5/10 on the 'bad memories of prunes and school dinners' Beerometer. Where to buy CPH : Superbrugsen if the have any left, otherwise possibly a bottle shop.